Maybe you’re already familiar with this herb, or perhaps you are left wondering exactly what is Dark Opal basil? 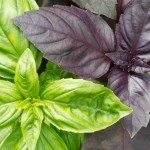 Either way, read on for more details on growing Dark Opal basil and a few of its many uses. There are scores of basil varieties, many are a traditional green color, but some are an eye-catching purple. Purple basils are unusual and attractive growing in containers in both indoor and outdoor herb gardens. Some purple basil plants, such as Dark Opal purple basil, are intensely aromatic. Plant Dark Opal basil where you can enjoy the fragrance as you enter your yard or along walkways as you stroll through the garden. Pink flowers add to the beauty of the dark purple, almost black leaves of this specimen. Growing a little more slowly than many other basil plants, the blooms of this plant appear in the flowerbed in mid to late summer. Keep flowers pinched back while using the leaves for culinary or medicinal purposes. Start seeds indoors or plant outside when temperatures are 65 degrees F. (18 C.) or warmer. Plant seeds of this basil in a light, well-draining soil that’s amended with well-composted materials. Allow 3 to 14 days for germination. Move into a partially sunny spot as leaves develop. Keep the soil consistently moist while germinating, but not wet, as young plants may damp off and fail. Move gradually into a full sun spot as plants mature. You may also propagate from cuttings. As this plant grows more slowly than other basils, begin pruning when it has taken on a few inches in upright shape with several leaves. Prune or pinch top leaves first to encourage new side branches to develop. Harvest often to encourage growth and a more attractive Dark Opal basil plant. When you’re ready for blooms on the plant, stop using the leaves, as they may become bitter during flowering. Use those trimmings in pasta or pesto or brew them for a therapeutic tea. Basil is said to calm the digestive tract, among other medicinal uses. Dark Opal basil info says this plant is “described as having a variety of medicinal and health benefits, and …a general restorative and warming effect, with a mild sedative action.” It is used to calm muscle spasms. Chewing the leaves improves nausea and even flatulence. Dark Opal basil leaves provide an antibacterial agent that clears up acne and treats stinging insect bites. The leaves may be torn or pounded for inclusion into your homemade bug repellent spray. Grow this basil along with tomato plants, as it encourages growth and repels pests of the tomato. Grow it in containers on the deck or near outdoor seating areas to help keep mosquitoes and stinging insects at bay. Store leaves, fresh or dried, for use during the time your plants no longer grow. Freeze them whole or preserve in layers of sea salt. You may also chop basil and combine with other herbs and oil to freeze in ice cube trays and save in freezer bags once frozen. This attractive purple color stands out in many dishes.